Warm weather means pool time, and there’s no better way to enjoy the water than by luxuriating in a pool float. 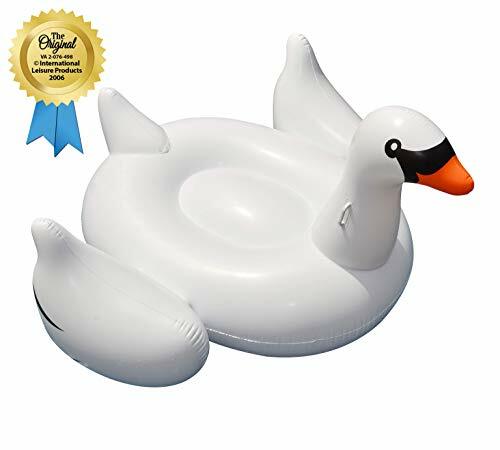 Whether you are at home or away on vacation, these inflatable gems will add to your enjoyment by providing a platform to rest and relax, all while placidly floating on the surface of the water. Pool floats come in all shapes and sizes, with some being immersive and others keeping you dry, and there is quite a variety of products to choose from. In this article, we’ll take a look at some of the best pool floats for adults and help you to decide which one is right for you. If floating on the water with a drink in your hand is your idea of relaxation, then you can’t go wrong with the Kelsyus Floating Lounger. Ideal for use at home or at the lake, the Kelsyus features a fabric coating for comfort, ensuring that your skin doesn’t rub up against plastic. The seat is constructed of mesh fabric and comes equipped with an integrated backrest to provide support while on the water. A foot rest will ensure your legs are positioned comfortably and won’t fall asleep while in use. As well, a built-in cup holder is ready and waiting to hold your drink for you. The Kelsyus features a unique spring located inside the unit to help provide maximum stability and comfort while floating, a handy feature to be sure. The float also features side clips which will allow you to tether it to a dock or boat, or to attach other floating products such as a floating drink caddy – all good options to help with your tanning! One drawback noted by users is that the mesh fabric may not last more than a couple of years when used in heavily chlorinated water. 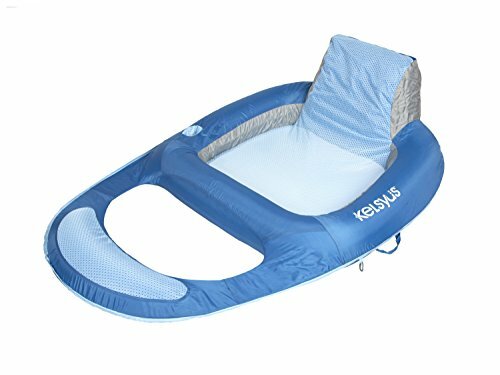 Despite this limitation, the Kelsyus is an excellent and comfortable flotation device that will have you relaxing in comfort and support while out on the water. For a no-frills and budget friendly pool float, the Intex King Kool Inflatable Lounge does the job admirably. 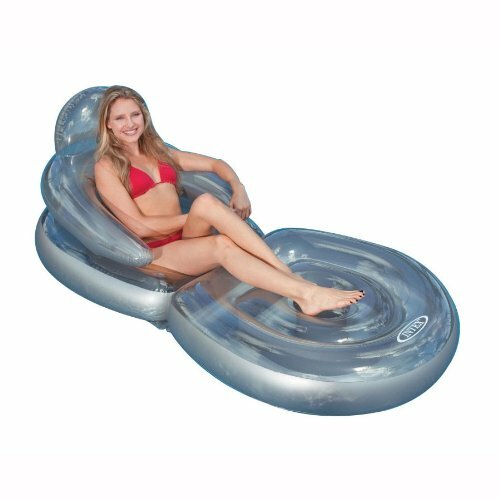 This 63″ x 33.5″ inflatable floating lounge is large enough for most people and provides support while resting on the water. It features integrated back and armrests for support and also comes equipped with a built-in drink holder. This float is long enough so that the end will act as a footrest for most people, adding to the overall comfort level. The unit is transparent and is accented by multi-color ribs which provide added stability. Overall, its design is classic by nature, and it’s easy to inflate and transport so it can be used anywhere. The King Kool also comes with a repair kit so small punctures can be fixed quickly and easily. As well, it features a dual inflation system with the backrest inflating separately so that you have the option of laying flat on your stomach if you prefer. It’s advisable to inflate it immediately upon receipt, as with any pool float, to ensure that there are no leaks. It should be noted that the King Kool comes in two color schemes, but the buyer isn’t able to specify a preference – one will randomly be sent to you. So despite the lower price tag, the Intex King Kool Inflatable Lounge is a comfortable and durable product which can be added to the list of best pool floats for adults on the market. Sporting a unique and stylish design, the Intex Folding Chair Lounge is a pool float that does double duty as a poolside lounge chair. Its large size – 80″ x 38″ – ensures maximum comfort and stability. Made of heavy gauge vinyl, this product is built to last. Featuring a triple inflation system allowing individual components to be inflated separately depending on preference, the chair folds down so it can be used as a deck chair or on the shore. The perfect way to tan! A high backrest and prominent armrests allow you to sit upright while you float on the water, and the large footrest provides added stability and support for your legs. The Intex is styled with a transparent top and a pearlescent silvery bottom, designed to reflect the landscape around you. The upright design will keep you completely out of the water, and ensure that your drink and any reading materials will stay completely dry. This can be either an advantage or a disadvantage, depending on personal preference as some people prefer to have their bodies partially submerged on a hot day. Still, this product features an excellent and innovative design and is sure to be a lasting pool float that will give you enjoyment for years to come. For an immersive floating experience, the Poolmaster Water Hammock Lounge provides for a refreshing summertime relaxation session. The head and knee rests are inflatable, and slung between them is a high-quality and durable “Texteline” material providing optimal support and comfort. It’s designed to allow you to float in a semi-submerged fashion, cooling you down on a hot day while you float atop the water. This float is, for all intents and purposes, a floating hammock. It’s not overly large so your legs will be floating free in the water, and there’s some question on how comfortable it would be for a very tall or heavy individual. And as it’s immersive by nature, it doesn’t come equipped with a cupholder and won’t keep reading materials dry. Still, it does what it does very well, keeping you comfortably supported as you float along. It’s easy to get into and out of, being partially under the water. The head and knee inserts can be easily inflated, and it conveniently rolls up for easy transportation in a suitcase. Users report that it’s extremely durable, with some noting that their Intex has lasted upwards of ten years without any noticeable fading of the colors. Despite the fact that this product may not be for everyone, it’s still exceptionally highly-rated and is definitely one of the best pool floats for adults. Novelty pool floats are a really cool addition to any pool, since they add an element of playfulness and fun to the environment. Not only that, but some are very comfortable to relax on and you can use them as your floating water bed. While pool floats are available in many shapes and sizes, with looks varying from old and simple to outright freakish, you must carefully choose your floats according to their overall shape and build quality. So, want to know the best novelty pool floats on the market? Read our review to see our star picks below! In case you are a fan of giant inflatable animals, you’re really going to love it when you see one of these huge swans floating around your pool. It measures over 75” in length, and is nearly the same in width. The back of this float is circular, and feels really comfortable when you sit or sleep on it. There are wings on the sides that you can use as floating assists, or you can simply hold onto them and climb on the back of the swan using the wings as support. Don’t try sitting on the wings because they are not designed to sustain the weight of adults. Children can sit on them just fine, and the colors are completely wash and fade resistant, as well as UV-resistant so they will not absorb much heat under direct sunlight. The float itself is very well made, it is constructed from thick sheets of vinyl and features reinforced stitching on the parts that are vulnerable to tearing, such as the sides and the wings. The weight capacity of this swan float is about 140 lbs. This incredibly cheap novelty pool float looks like a pretzel, and has three cavities shaped into the body, just like a real pretzel. It can conveniently fit three kids into the spaces between the curls, and looks incredibly cool. Imagine a huge, colorful, crispy snack floating around in the middle of a pool, and you’ll begin to understand why kids are going to love it. 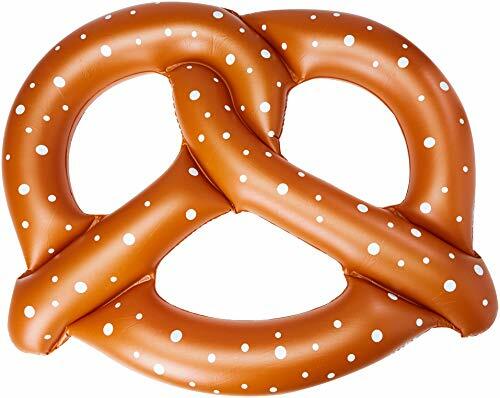 It is an absolute delight to relax on this inflatable pretzel on a hot sunny day. Just don’t try chewing on it, because it is actually made from super tough vinyl and has a rubbery smell to it. The colors are of course UV resistant, and don’t fade or wash away with time, so you can rest assured of this product’s quality. It measures nearly 60” in diameter, and only takes about 5 minutes to fully inflate if you use a bicycle pump. People love food-shaped pool floats, and if you’re one of them, this half-eaten strawberry frosted donut is going to be one of the best things that you could decorate your pool with. It is coated with sprinkles (well actually the whole thing is just paint, but it looks cool!) and one of the sides is shaped like someone just bit off a piece from this huge 4 foot donut. The hole in the middle is large enough for adults to slide in, and the paint is 100% UV resistant to keep you cool even through the sunniest of days. 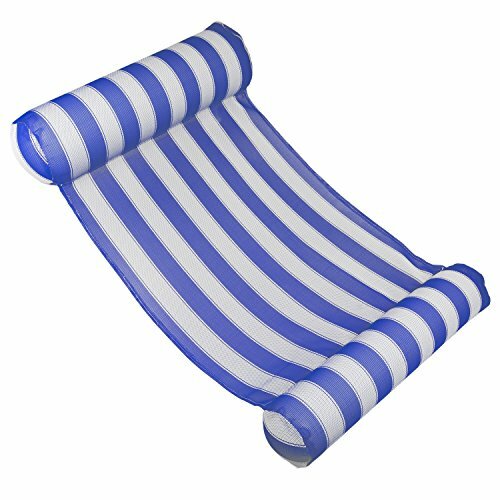 In terms of quality, this pool float is made from highly durable vinyl and is heat treated at the seams to ensure a solid and leak-proof seam line across the entire perimeter. Besides, it is made by BigMouth, this company is famous for being the provider of pool floats for various reality TV shows, celebrity houses, and social media sites. What better way to tan than on a donut? 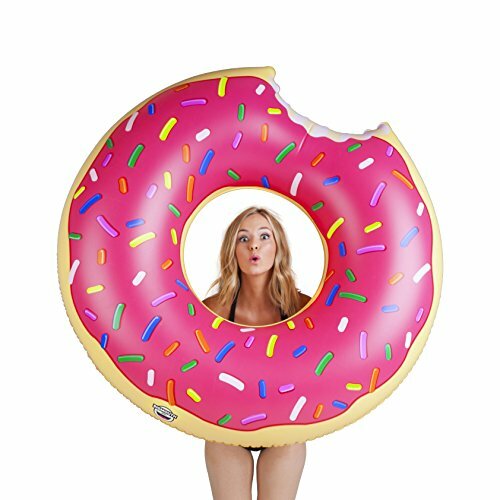 Since we have been showing so much love to pool floats shaped like food, why not bring in the ultimate food themed pool float? That’s right, this is a pizza float, and it looks as delicious as you would imagine a pizza float to be. The paint is absolutely perfect and mimics little toppings, while the cheesy headrest makes this one of the best floats for laying back and taking a nap in your pool. Yes, all of them will float just fine, but some shapes might not be right for your requirements. Say for example, your primary reason for buying a pool float is to use it like a floating assist, in case you’re not an experienced swimmer, or have limited experience in pools. Then you don’t need a giant, fancy looking pool float, rather you need one with a shape that comfortably fits around your body. On the other hand, if you’re searching for a float that is capable of supporting 2-3 adults, or 4-8 kids, then you need something that is at least 6′ long and nearly as wide. It must have heavy duty stitching at the seams, so that they don’t come apart when the float is loaded with the body weight of 2 or more people. 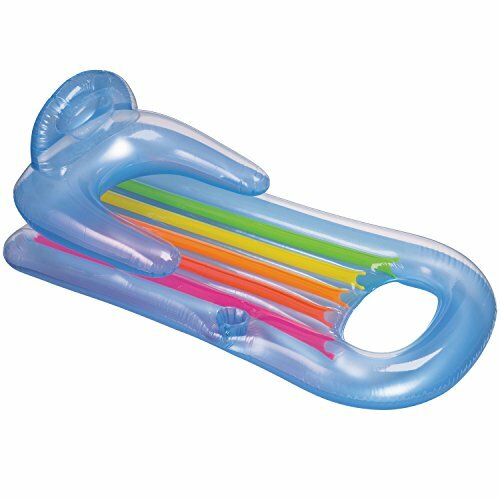 Most large floats are capable of supporting at least two grown up people, so if you buy 2 or 3 of them, your whole family can have a nice time in the pool on a hot summer day. You should try to get a float with UV protection and a folding canopy to protect you from the sun, if you’re concerned about sunburns or have sensitive skin. Most novelty pool floats are loaded with colorful patterns and designs, so make sure to check the quality of the printing before you buy a float. The colors on a cheaply made pool float will wash away over time, and your novelty float won’t look as fancy as it used to a few months ago. Almost all modern day pool floats are made from vinyl, so check the thickness of the vinyl layer used to make the body of your float. Thicker vinyl ensures greater durability, but it also makes the float heavier and harder to transport. Also, unless you’ve got a bunch of kids who like to jump around on the float, you don’t need one with more than 150-200 lbs of weight capacity.